(Kansas City, Mo. – Dec. 21, 2017) Area transit providers will observe the Christmas holiday on Monday, Dec. 25, and New Year’s Day holiday on Monday, Jan. 1. 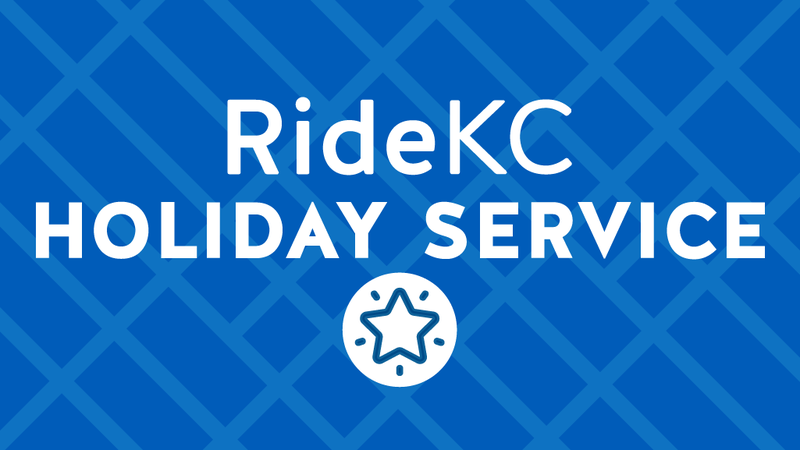 On Dec. 25 and Jan. 1, RideKC transit and KC Streetcar will use Sunday/Holiday schedules. KC Streetcar will operate a Sunday schedule, 7 a.m. to 10 p.m. On Dec. 31, New Year’s Eve, KC Streetcar will operate from 7 a.m. to 2 a.m. RideKC service operated by Johnson County, Independence and Unified Government Transit will not offer service Dec. 25 and Jan 1. The Kansas City Area Transportation Authority’s Regional Call Center, administrative offices and customer service lobby also will be closed to observe the holidays. Regular weekday service will resume on Tuesday Dec. 26 and Jan. 2, for all transit service. To help Kansas City celebrate New Year’s Eve safely, RideKC will offer free bus rides from 4 p.m. Sunday until the end of service after midnight. On the evening of Sunday, Dec. 31, all RideKC buses will be free to help holiday revelers get to and from their destinations safely. Riders can plan a trip at www.ridekc.org, using the trip planner on the home page. Sunday service includes service in Kansas City, Mo., Kansas City, Kan., and North Kansas City. Customers can get help planning a trip by calling the Regional Call Center at 816-221-0660, weekdays from 6 a.m. to 7 p.m.